Pip & Nut, makers of nut butter, are popping up at Whole Foods in High Street Kensington for two days to celebrate Shrove Tuesday. Taking place on Pancake Day itself, Tuesday 13th, and on Monday 12th February 2018, they will be serving pancakes from 9am - 7pm, with happy hours between 11am and 12 noon, and 4pm & 5pm, where the first 100 pancakes will be given away free. Go! "Come and celebrate Pancake Day with Pip & Nut. 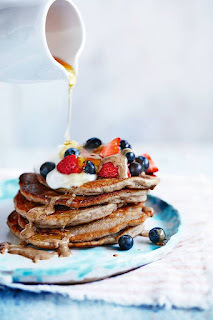 We're taking over Whole Foods Kensington with a two day pancake pop-up on 12th and 13th February, 9am - 7pm. We'll be whizzing up sweet and savoury options with a whole range of tasty toppings."